Admittedly the JBD White Horse Inn is not notable by it’s outside appearance. In fact, having been to a movie theater near its location more than a dozen times, I havent noticed it. Also, if an old grammar school classmate hadn’t taken recent ownership, I would have never had stopped. But I saw numerous updates about the new menu and inviting atmosphere, so I just had to stop. What I ran into once I was inside what a immense surprise. The service is excellent the beer was served quickly. The ambiance is similar to the Cheers! The owners, Jim and Annette, make you feel so comfortable. It’s almost as if you walked into someone’s home. It was warm and inviting and beyond enjoyable. Not having see Jim for a few (more than 25) years, we caught up about our families and lives. He introduced us to Annette and it was like we actually had seen them everyday for the last 25 years. There are several big screen televisions, great sound, and a small, intimate feeling to the bar. Just a great place to watch a game on the TV, have a cold adult beverage. and have something from their food menu. The burgers were really good, the soup excellent, and the service really good. Jim gave a rundown of the changes he had planned and and had already changed. He wanted to update the exterior, had already updated the menu (all of the food is excellent), and had really emphasized that the service was upgraded when he and Annette took over. 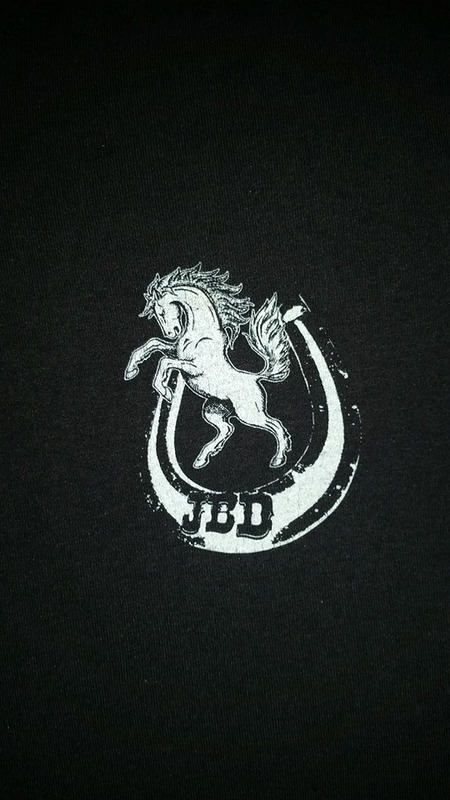 For a comfortable time, with a cold beverage, and good food, and excellent atmosphere, try the JBD White Horse Inn, you wont be disappointed. Mullets is indeed named after the haircut that is spiked in the front and long haired in the back. Their tag line is Sports in the front, Party in the back. This fits nicely with the design and space of the restaurant. The front part of the restaurant is fully stocked sports bar. With great site lines to the dozens of televisions that are mounted on the walls and over the bar, there are plenty of sports choices to view. There is a good list of beers to choose from as well as drink specials. There is also a dance room in the back. More scaled to a crown that wants to listen to a DJ and get their dance groove on. It provides an area that can also serve as a party room for special occasion. Admittedly, having been at Mullets a few years ago, I was disappointed in their food. Having noticed advertising of a new menu, we decided to try the food again. We were pleasantly surprised. The quality of the food had improved, the service was much better, and the beer choices were excellent. So, Mullets has earned a chance to be re-rated. This is a special kind of hole in the wall. To me a restaurant with with that status means it is not to be forgotten when you are in a certain area. This place doesn’t look particularly special, or have a large neon sign, but once you have eaten there, you will not ever go somewhere else. Sammy’s Kitchen is located on the outside of Midway Airport in Chicago, just east of Central Ave on the north side of 55th street. It does not stand out. But look hard for it and drive around a bit to find it. It is on the same building as a bar, and has an incredibly small parking lot. But it is worth the time finding a parking spot. One note – BRING CASH. No credit or debit cards. No checks. If there is a wait, then wait. There are only about 30 seat in the whole restaurant. There are no white linen table cloths. Just hard working people from Midway, police officers, and firemen enjoying huge plates of food for a ridiculously low price. The picture in the review shows a one pound (!) piece of ham steak on the plate. 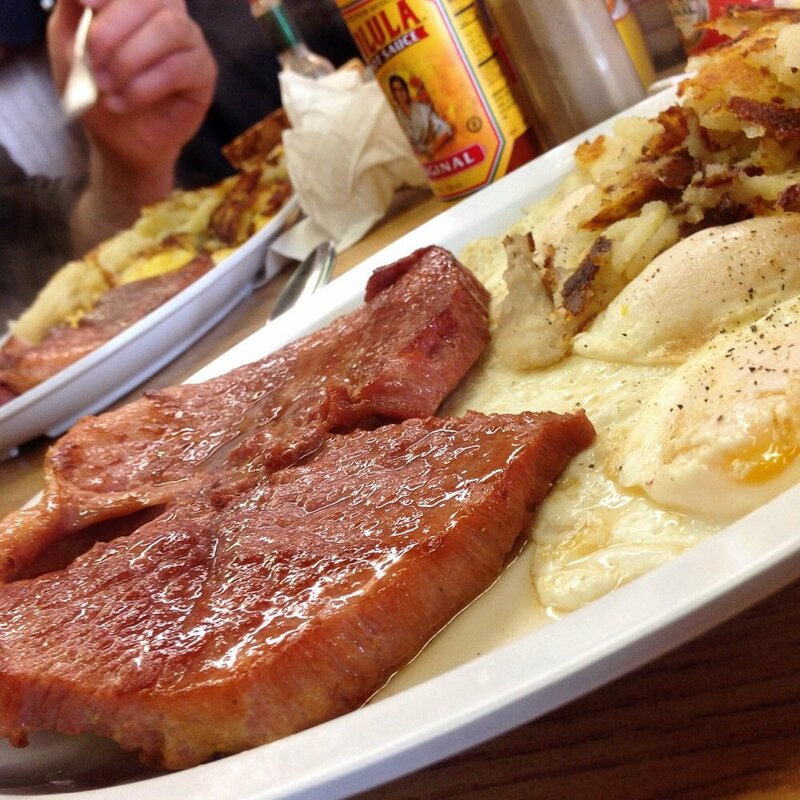 This breakfast special includes three eggs, hash browns, and toast or pancakes. The whole meal is $6.50. Yes, that right, $6.50!! And the food is done just perfect, is brought out quickly, and you are constantly asked about your experience and if you want more coffee. Just a fabulous little diner. While standing in line, I watched the meatloaf platter go buy with mashed potatoes, gravy, and green beans. With the additional cup of Navy Bean soup (and it was to die for) the whole meal was $8.50. It provided two days worth of meals! The portion was huge! So if your by Midway Airport, do yourself a favor and go to eat at Sammy’s Kitchen if time permits, you wont ever be disappointed.